I have been searching for explanations regarding miracles reported in the Bible. RESPONSE to "22 MIRACLES YET TO BE RESOLVED"
Tyrese Biggums (Investigator #164) lists 22 miracles that he is "struggling to accept as being historically factual." These websites are run by ministries that promote the Bible and have statements of belief. Their starting position assumes the Bible to be "inspired of God" and true throughout. Biggums, however, does not accept this starting position and wants evidence that the 22 miracles took place. For the purpose of investigation I do not assume the Bible to be true or false, but test it statement by statement whatever seems testable. My starting position is science; and I investigate how far scientific discoveries can take us in assessing the Bible's accuracy. Most of the people mentioned in the miracles Biggums listed lack archaeological confirmation. Therefore we cannot currently confirm the miracles as "historically factual". Is there an alternative to archaeology? 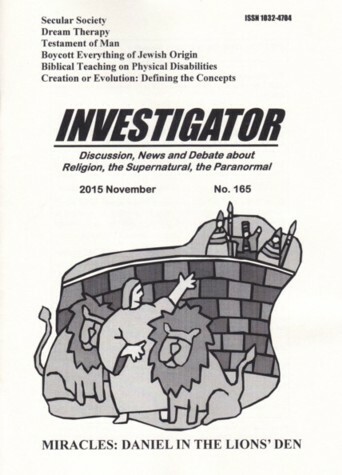 In previous editions of Investigator I presented evidence to support about 25 of the Bible's reported "miracles". Often the answer lay in rare natural events occurring at just the right time to influence human history. Such an explanation changes the "miracle" to a miracle of coincidence. Many of the Bible's miracle stories include statements about natural things that we may be able to check or confirm. If certain details or components are testable and confirmed then we have partial support for the miracle, and this is better than no support. We should also note that the scientific details came to light after thousands of years. If we want scientific explanations we have to wait for science to discover them! Scientific support of the Bible is progressive, one verse or one statement or even just one word confirmed at a time — but the process has continued for centuries. Three of the "miracles" in Biggums' list are resurrections. Ancient people using the words "dead", "death" and "died" did not know 21st-century definitions and what they called "death" might not be so-called today. The Humane Society of London, founded by doctors William Hawes (1736-1808) and Thomas Cogan (1736-1818) in 1774, was initially the "Institute for Affording Immediate Relief for Persons Apparently Dead from Drowning". Soon after its founding one member attended an infant girl who fell out of an upper story window and was pronounced dead because she had no pulse or respiration. He administered electric shocks to her chest with a portable electrostatic generator and she recovered. David Casarett (2014) describes some amazing cases of people who did not breathe for up to an hour and were clinically dead but who recovered! Misdiagnosing living people as dead was more common further in the past when criteria for pronouncing people dead were less clear. The 18th and 19th centuries saw a thriving industry of "safety coffins" for people who feared being buried alive. Safety coffins might have air tubes, strings to ring bells above ground, and escape hatches. The Old Testament resurrections, therefore, may refer to natural recoveries from "death" or coma at a crucial moment to appear miraculous. If this suggestion is accepted then the Old Testament resurrections become "miracles" of coincidence. Knowledge magazine, October 2015, reports that crows have "incredible intelligence", and may respond to kindness by bringing "gifts". One crow brought gifts to a young girl for four years such as buttons, key rings, paper clips, coloured stones, screws, ear rings, shells, etc. Another crow brought food in the form of insects to an injured kitten. For more information enter "Crows Intelligence" into Google Search. We therefore have the possibility that Elijah had befriended the crows, perhaps fed them on earlier occasions, and they responded in kind. The Bible quotes the "LORD" as saying to Elijah: "I have commanded the ravens to feed you…" The "LORD" saying this would be a supernatural event and not testable. That crows could potentially bring "bread and meat", however, is supported by modern observations. What of "Daniel in the lions' den"? That lions might not harm people who raised them is scientifically confirmed, but Daniel's claim that an "angel shut the lions' mouths" is not. Nevertheless, a bit of confirmation is better than nothing. At least six "miracles" out of Biggums' list of 22 could be in part natural events. Some of the others I may consider when more information comes to hand. Remember however, that these six and the approximately 25 others I discussed on previous occasions required thousands of years for scientific explanations to be found. With about 47 miracles (i.e. 22+25) considered and about 31 (i.e. 25+6) having partial or possible explanations it points to a trend. And when we see a trend we can extrapolate and make predictions.